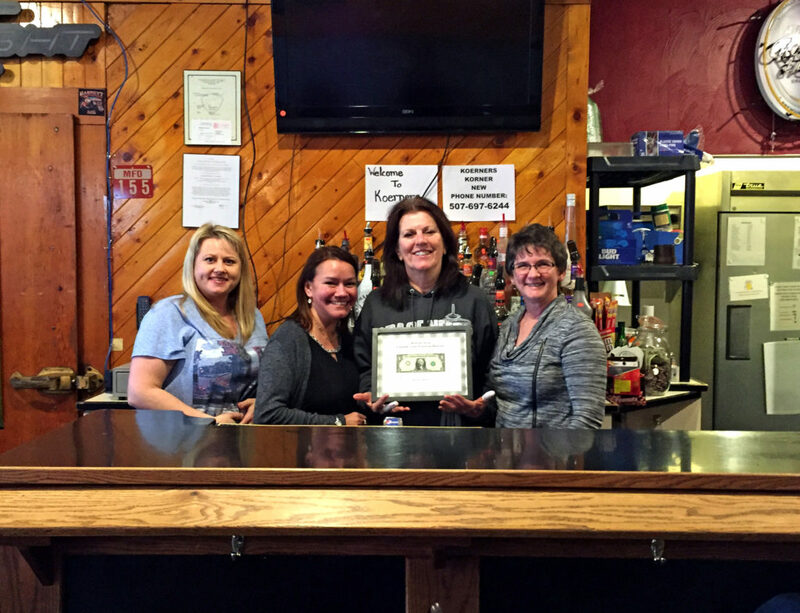 The Morton Area Chamber presented Koerner’s Korner (formerly Cousin’s Saloon and The Morton Pub) with their First Dollar of Clear Profit certificate. Judy Sindelir purchased the bar and grill in Morton at the beginning of the 2018. They celebrated their Grand Opening on Thursday, March 29th, 2018. Koerner’s Korner is located at 185 North Main Street, Morton, Minnesota 56270. They sport a full bar and a delicious menu of burgers, appetizers and more. Call 507-697-6244 for more information! Pictured are Chamber members Sarah Madsen (Morton Chamber Board Member) and Nicole Elzenga (Morton Chamber President), Judy Sindelir (Owner of Koerner’s Korner), and Bonnie Green (Morton Chamber Secretary/Treasurer).